My partner-in-crime Caroline and I anticipated Hereditary for months, so you can believe that we were in that theater on the morning of opening day. I do have something to say about this film, but it constitutes even less of a “non-review movie review” than usual. This is not a review of the movie. It’s a mere commentary on my reaction to it. First, I found the ending to be disappointing, which affected my immediate opinion of the whole movie. I don’t know what I was expecting the ending to involve. I guess I wasn’t expecting it to involve what it did. It wasn’t the ending that I wanted. Well, that was my problem, because the movie turned out to be an overwhelming success for me as a person who loves to get scared by horror movies, and who very rarely gets scared by them. Hereditary got to me. I just didn’t realize it until later that day. And that night. And the next day. And that was the beauty of it: the delayed reaction. I didn’t think that Hereditary had any effect on me, but then the day drew to a close, the sun went down, and I started to look around the house apprehensively. Hours later, I got ready for bed feeling more than a little creeped out. I thought back to the movie and couldn’t pinpoint a single scene or instance to blame. 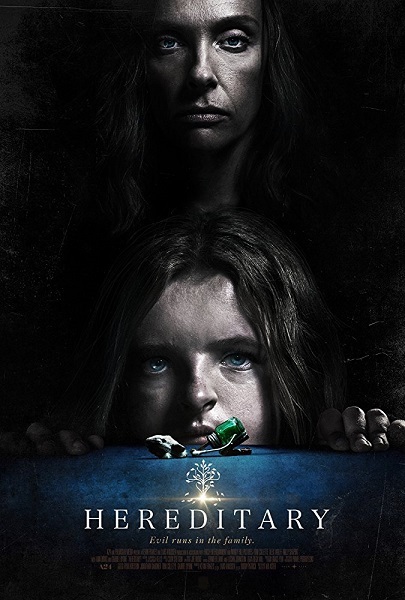 Hereditary wound itself into the back of my mind, and then its creep-factor unraveled forward and stayed with me for a good two days. That night, I couldn’t bring myself to turn off the dim lamp in the dining room when departing with my glass of water. For the first time, I was so spooked by a movie that I didn’t want to turn out the light. I’m not afraid of the dark. I went to bed with my heart thumping in my chest. Tired as I was, I stayed awake. Then I had to pee, but I was loathe to get out of bed, so I held it. How old was I the last time that happened, if ever? Five? A shuffling sound moved quietly across the space by the closet. I couldn’t breathe. Callaghan didn’t move. When it happened a second time, Callaghan murmured that it was the fan blowing his cup off the nightstand, which didn’t make sense because the small fan was sitting on the floor, and the cup was up above and full of water. He reached down to turn off the fan. I didn’t hear the sound again. The next day, I went around with many questions in mind. I couldn’t stop thinking about the movie. Caroline and I discussed it in a flurry of messages. She said that when she woke up at 2:44am to get a drink of water, she was “kind of freaked out and heard noises” as she walked around in the dark. I would say that this sums up our joint reaction in terms of scariness on a scale of 1-10: ghghhghg. I’ll be going to see Hereditary again… with Callaghan. This time, it’s his reaction that I’m anticipating.